This chick is taking a journey called Life. Wanna come along? Yesterday, the speaker at our Bead Society of Orange County meeting was Jim Stevens, a scrimshander and martial artist. What’s so inspiring about Jim? He’s legally blind. As a soldier in Vietnam, he was wounded in the head, which left behind shrapnel, causing migraines and finally a stroke that left him with only a pin dot of sight. It took him 7 years and the help of his daughters to accept and overcome the limitations of his blindness, all the while raising his 5 children as a single parent after his wife left the family. Anneliese, Barbara and I met Jim in the parking lot of the Bowers, accompanied by Melinda, who was his Bead Society “official chauffeur” and chatted for a few minutes before going into the museum. It was only when we saw him walking into the auditorium with his white cane that we realized he was blind! He gave a fact filled talk on the history, legalities and art techniques of scrimshaw and brought along a few examples of the different types of materials, such as whales teeth (very, very heavy--imagine a mouthful of those! ), bone and ivory. The ivory Jim uses is mostly ancient wooly mammoth, which is not prohibited in any way since it’s not from living animals, endangered or otherwise. He gets a lot of this material from native Alaskans, who make a living digging for this type of fossil ivory. He creates beautiful powder horns and carvings as well as his scrimshaw art. Also, there’s an article on him in the current issue of the Saturday Evening Post (May/June 2011), which I’m going on the hunt for as soon as I finish the post! Here’s my friend, Barbara Bastrup, who has 9 pages of her work in the next issue of Somerset Gallery, coming out this Wednesday! 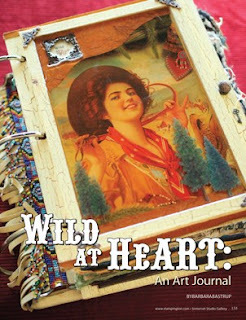 8 pages are beautiful pictures of her exquisite art journal and a single page toward the end is her Annie Oakley shrine. I should get some credit here because I badgered… I mean encouraged her to send her things to Somerset :-) It took a whole year, but she’s finally in print! Proud of you, girl!! Trust me to find jewelry wherever I go! The Husband had a gig at the Orange Empire Railroad Museum in Perris, CA, last weekend. Here's a glimpse of some of the trolleys, cable cars and trains you can see at the OERM. To see more, go to my FB page or log onto the website for the museum itself here. This year, I'll be eligible for some Senior Discounts. Yes, I'll be 55. I want a pin I can flash that says "Where's My Senior Discount?" Maybe I can have one made on Etsy! One of my favorite blogs is Advanced Style. There are wonderful pictures and sometimes videos of older folks in wonderfully stylish or creative outfits. They're such an inspiration to me, as I approach my own golden years. I have made a conscious decision not to fade into the woodwork as I get older. No disappearing act for this girl! As I buy new clothes, they're going to be colorful, with a few dark colors to contrast dramatically. But my real Style Signature will be bright shoes. I'm already starting to collect the brightest shoes I can find. Here's a tip--the brightest colors tend to be in the kids department. I'm so lucky I can wear a kid's size 4! And some shoes I've had for a long time. I knew I kept these for a reason when I was downsizing recently! My younger co-worker calls these my “cool kicks”. And the pair I bought when I went on a cruise over Halloween with my BFF, Zan. Right now, I’m on the hunt for sapphire blue flats, preferably with a good amount of sparkle! So, while wandering the aisles of my neighborhood Michael’s, I saw this little red table. It had so much potential that I took off the necklace I was wearing and made sure it would work the way I needed. It’s only 19 ½” high and has a relatively small footprint. And the flowers and scrollwork make perfect hangers. Voila! Problem solved. This was the first show I’d done since I got a phone I can access the internet with. What a luxury! Usually, I have to put my online shops on “vacation” mode, so I don’t run the risk of selling something online AND at a show--that would be very awkward, since most of what I create is one of a kind. I’ve had that happen with vendors I wanted to buy something from--it is most uncool to hear that the unique item you want is no longer available… So now, when I have a sale, I can go to my Etsy or Artfire shops on my phone and deactivate that item. How awesome is that?? I’m a 50-something girl still trying to figure out who she wants to be when she grows up. This journey called life, with its twists and turns, offers surprises and trials, joy and ennui, but in the end, it’s what we make of it, so I’m embellishing it with all the creativity, curiosity and sparkles I can! Right now, I'm navigating the rocky shoals of unemployment... As long as I’ve got The Husband and The Cats (Watson and Raina) on my support team, I know I’m gonna be ok! Doodle Sun Love Pendant~~a bit of bench time! Sign up for my Fun, Stimulating and Money Saving Newsletter!